IdenTel-RF system was originally designed for the identification and inventory of passive elements attached to the outside plant telecom and power grids. 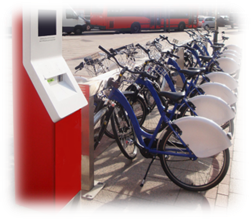 Since then, the system has been applied to many other projects such as baggage identification systems, attendance control, or rental bicycles/mopeds management systems, among others. IdenTel-RF is based on the Hitag technology. RF operates in the 125 kHz band, comes standard with an RS-485 port, but optionally it could include any other (Ethernet, RS-232, etc.) interface. The solution consumes less than 700mw and its power supply range is 12 to 24 Vdc. Due to its open and versatile design, and the ability to create custom Tellink embedded applications, IdenTel-RF is an optimal OEM solution, able to integrate as a functional element within higher systems. Contact Tellink and we will find out the best solution for your specific requirements.